The latest group of bicycle tourists to stop by the Peninsula Century Cycles store yesterday were Malcolm (left, in white) and Brian (right, in red). They hail from Ottawa, Cananda. They started their trip by flying out to Vancouver, and pedaled over the border into Washington state on June 28. They hoped to reach the Pennsylvania border last night, and plan to continue to Maine during the next week or two. No, but the two young women who were driving the weinermobile did rent bikes from us! LOL! I guess her driving skills didn't really cut the mustard! 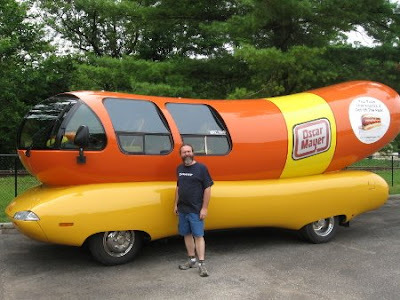 The drivers of the one in Peninsula told us that there are six Weinermobiles that travel the country. They (and we) are part of the "northeast region." They will be in the Hall of Fame Game parade in Canton this weekend, as well as some other smaller events in NE Ohio, and then will be heading up to Rhode Island. Btw, I think there's something wrong with that house... It's all tilty... I think it was like that before the crash.